As it turns out, her instincts were dead-on. The segment ran short by three minutes, but Frances was able to update her post with Harris-Perry’s own clarification. Instead of thanking Frances for fixing their mistake, however, TRMS producer Jamil Smith slammed her in a blog post, and on Twitter. Last night’s segment on Michael Vick and the President was the subject of a rather curious blog post on Mediaite, less than an hour after the show aired. “Curious” is meant literally, for it was a blind effort to understand what our guest, Melissa Harris-Perry, had been saying. Let me be brief here: the post reads like a cautionary tale for leaping before looking. (The comments that the writer’s misinterpretation inspired are well, inspiring.) There’s the initial overreaction, followed by the subsequent “Oh, that’s what she meant” update that posted Dr. Harris-Perry’s tweets expanding her points. The live-television reality is that her segment was cut so short was because we ran out of time. I’m glad, as the producer of the segment, that Dr. Harris-Perry was able to find a public medium so quickly to share her thoughts and clarify her remarks. Not soon enough for all those who copied the post, it appears. I’m also glad that Mediaite is watching our show, that they’re feel so urgent a need to write about the topics we cover, and that their writer corresponded with Dr. Harris-Perry to get her actual perspective so soon after the post went up. That said, this episode shows that “Fools Rush In” isn’t just a bad flick starring Matthew Perry, if you know what I mean. It’s also a warning. What he should have said: I’m sorry we blew it, and didn’t give @MHarrisPerry a chance to finish her thought. When I don’t understand something someone says, I do my best to engage, ask questions and learn. Others, it seems, just throw up blog posts. What he should have said: When I screw up and don’t allow a guest to finish her thoughts, I blame the people who point that out. Others, it seems, just go out of their way to fix my mistake by allowing that guest to clarify. What he should have said: Thank you, Frances, for going the extra mile to fix our regrettable mistake. Smith’s ire rests on a fundamental distortion of the nature of media criticism. If your work product is incomplete, it is not the media critic’s duty to help you complete it. The extent to which Frances did so anyway is to her credit. She updated her post within hours, adding Harris-Perry’s lengthy Twitter clarification, and even emailed her for additional material. Professor Harris-Perry, to her credit, appreciated the opportunity. She has since posted a much more detailed explanation of her point for The Nation. This is a common dodge by media types who get it wrong the first time, the “why didn’t you call me?” defense. The answer is, of course, that the correct presumption of the media critic is that the subject said what they meant to say. 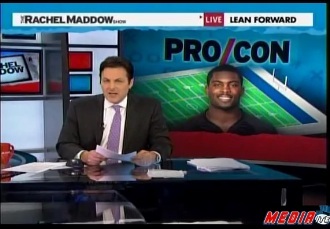 Is anyone calling Tucker Carlson before they “rush” to critique his remarks on Michael Vick? No, because they have no duty to do that. As for Frances’ initial critique, given the incomplete nature of the professor’s commentary, it was fair and thoughtful, and was written with an obvious effort to do Harris-Perry’s remarks justice. I must confess that I don’t have time to even read everything that’s posted at our site, but I read this piece intently. From Frances’ description, I had a pretty good idea of what Melissa Harris-Perry was driving at, but I had also read a pithier variation of this argument from This Week in Blackness’ Laura Martin, so the missing dots were easier to connect. This episode is doubly disappointing for many of us, myself included, who are big fans of The Rachel Maddow Show. The program and its host have an appeal that reaches across ideological lines, as evidenced by the frequent guest appearances by conservatives. The fact that they ran out of time during a segment shouldn’t be a big deal, especially when you consider that Executive Producer Bill Wolff was doing double-duty as guest host, a challenging spot to be in. Finally, though, I’m really, actually glad that the folks at the Maddow Show are reading Mediaite, and hope they see fit to give Frances the credit she is due. I’m curious about your reaction to Frances Martel’s post (full disclosure: Martel is a former co-worker). This incident seems to me to be a ‘cautionary tale’ of live TV more than a writer ‘leaping before looking.’ Since when is the onus on a viewer to disseminate the behind-the-scenes decision making of a live TV broadcast? Frances, from what I can tell, did not make a “blind effort to understand” what Professor Harris-Perry said. She responded — and well it should be added — to what was provided her from a mainstream news show that has reputation for allowing more than the usual cable TV soundbites. Her effort gave a fair accounting of what Harris-Perry said and further highlighted the analysis you failed to provide for your viewers. Are you suggesting that viewers question whether every guest on your show was or was not given enough time to explain themselves properly? Moreover, Frances’ correspondence with Dr. Harris-Perry to get her “actual perspective,” which, it should be noted only became clear _after— your show and _because— Frances followed up, was exactly what it should have been: speedy, comprehensive, and open to dialogue. The result is that we are now able to benefit from much longer discussion, both in Frances’ post and in Prof. Harris-Perry’s Nation post, on a topic that can safely be said does not get enough attention.